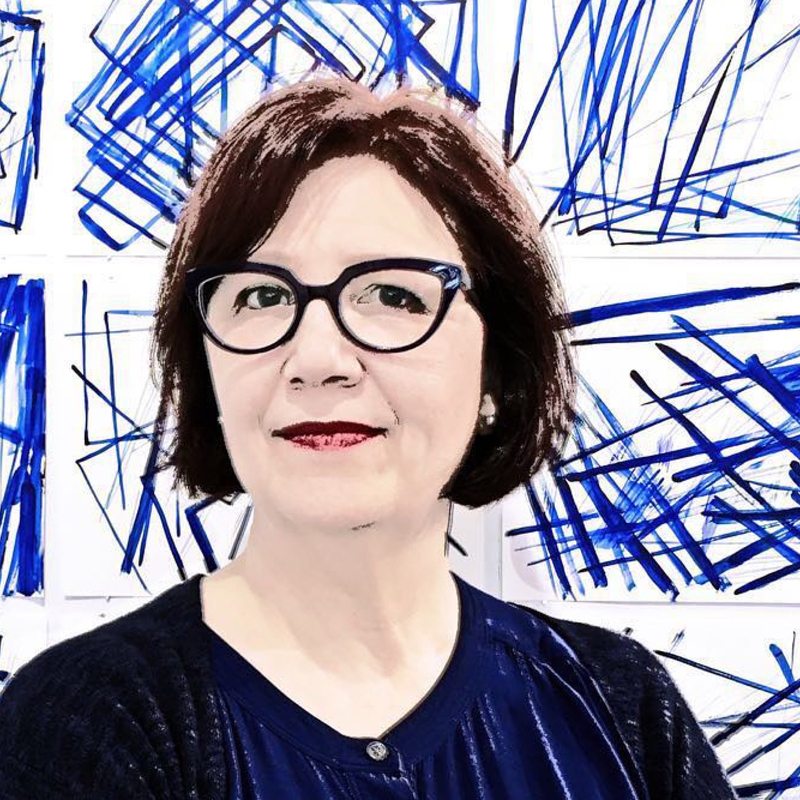 Patricia Van Dalen (Maracaibo, Venezuela) is a Miami-based visual artist with an extensive and recognized career that spans over thirty-five years. After earning a degree in graphic design from the Instituto de Diseño Fundación Neumann IDD, in Caracas, she trained and worked in Paris under kinetic artist Yaacov Agam, between 1980 and 1986, in the creation of the Agam Method of Visual Education. Van Dalen’s artwork has been the subject of many solo exhibitions such as Pinturas y dibujos, Galería Minotauro, Caracas, 1985; Patricia Van Dalen, Sala RG, Casa de Rómulo Gallegos, Caracas, 1991; Primavera, Sala Mendoza, Caracas, 1993; Casa/Jardín/Ventanas, Universidad Simón Bolívar, Caracas, 1998; Del cosmos al jardín, Museo de los Niños, Caracas, 1999; Luminous Gardens, Fairchild Tropical Garden, Miami, 2003; Color fragmentado, Sala TAC, Caracas, 2008; Colección primavera-verano 2010, Galería La Cuadra, Caracas, 2010; El color como estructura, at the Centro Cultural Chacao-La Caja and Galería GBG Arts, Caracas, 2012; High Voltage, ArtMedia Gallery, Miami, 2013; Ride the rail, ArtMedia Gallery, Miami, 2017; and the Abstract Cabinet. Patricia Van Dalen & Emilio Narciso. Duo Project, at Imago Art In Action, in Coral Gables, 2018. She has also participated in numerous group exhibitions, such as Bienal de Guayana, Salon Aragua and Salón Michelena, in Venezuela; Grands et Jeunes d’Aujourd’hui, in Paris, France; Novos Valores da Arte Latino-Americana, in Brasilia; the Bienal de Estandartes, in Tijuana, Mexico; and Bienal Barro de América Roberto Guevara, held in Venezuela and in Brazil. Apart from an extensive body of work on canvas and on paper, featured in both private and public collections internationally, Van Dalen has produced multiple site-specific installations, some of them large-scale, mostly in Venezuela and the United States. In 2011, Fragmented Light was specifically designed for display at the University of Georgia’s Miller Learning Center (Athens, GA), and, more recently, Natural Intersections, for The Kampong Botanic Garden (Coconut Grove), and Data Hall for the Center for Computational Science at the University of Miami. The use of media in her body of work ranges from painting, graphics, collage, prints, drawings and, more recently, assemblage, photography and video, to the design of stained glass, tapestries and carpets. Her interest in the intervention of architectural spaces is similarly evident in permanent works created for private residences in Venezuela and the US, as well as public murals in Caracas, such as monumental-scale Jardín Lumínico, Pajaritos; and in Eastern Venezuela, the plaza’s mosaic floor Jardín de Calas, in Río Caribe. She has earned various awards throughout her career, including the Second Prize at the II Biennale of Visual Arts Christian Dior, Caracas, 1991; the First Prize at the I Salón Nacional de Artes Visuales, Caracas, 1992; the 2001 competition for the commission of a large scale mural along the Prados del Este Highway, in Caracas; and the International Association of Art Critics’ 2010 Established Artist AICA Award, at the Venezuela Chapter 2011. Van Dalen has taught at the Fundación Instituto de Diseño and at the School of Architecture, Universidad Central de Venezuela, in Caracas, and often conducts visual language workshops at her studio in Coral Gables, the Interamerican Campus-Miami Dade College, and other cultural institutions in Miami. With a production written inside the abstract art, her most recent work explores the poetics of structures through the fragmentation as it affects form, line, surface, space, and color.